Portuguese, by Brandon Shimoda. Portland, Oregon: Octopus Books/Tin House Books, 2013. 100 pages. $14.95, paper. 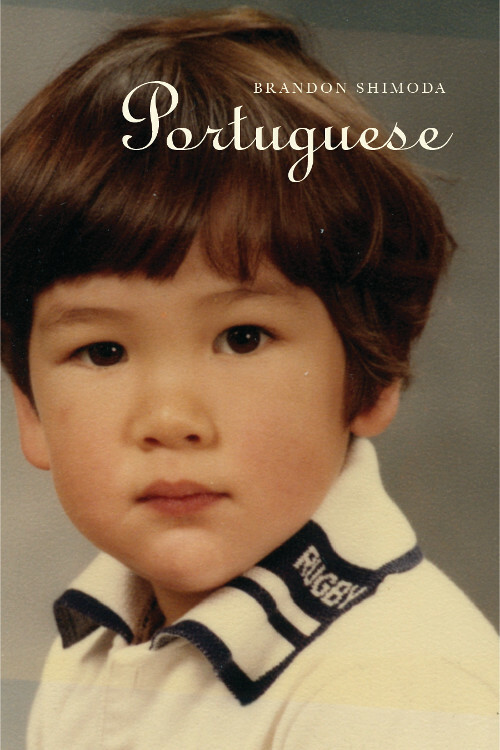 Brandon Shimoda’s Portuguese is the result of a collaborative publishing venture between Octopus Books and Tin House Books. From this information alone, you’d be right to expect something that, at the very least, is interesting. Portuguese is not only interesting, it defines new expectations about poetry. Now I expect more from poetry. There’s the “Oh, I wish I had written that” response to a book, then there’s the “What the hell just happened?” reaction. Mine was the latter. I mean, there’s us: eating happy-hour salmon spread, worrying over next week, stuck at the bottom of the air. We get fired or contract some infection—things keep happening—but we meet a book: now it’s harder to think about things. Two weeks ago I had a tooth pulled. Amid the flurry of yanking and drilling I was still thinking about the structure of this book. When we talk about structure there is a certain sense of the solidity of an object. Shimoda’s work sets up an immediate and sustained tension with a sense of solidity. Structure here consists of the weaving together of singular poems, sections from a long poem (“from Yellow Picnic”), poems that share the same title, and excerpts from the writings of visual artists. Structure as object solidifies and dissolves over and over, creating an impression of movement and energy. Energy not captured and contained, but created. A momentum is built through the repeated slight hesitation at the end of each line. Without a full end-stop or clear enjambment, a wave-like rhythm of crest and trough carries the eye through the poem. This rhythmic sense comes through as well in the way poem titles appear and reappear throughout. These lines come from a poem called “Poems,” part of a focus on writing and art woven throughout. There are some wonderful assertions about the nature of art in these poems, about poetry and poets. This is poetic language that is assertive without being dismissive. There is still “a moment of actual attention” to be had. Language is not, we learn elsewhere in this poem, an “accommodating solvent.” It’s “pressure.” A pressure is exerted on history, on place, on the subject—a pressure not for some simple coherence but to circle around what’s missing. There is loss and constant attempts to recollect the lost. Portuguese challenges us to slough off the husk of our worn-out poetic expectations. Here poetry creates the conditions for thinking/feeling without dictating what that should be. This is a stunning book. It stuns, though, not to anaesthetize but to activate, to heighten awareness, not dull it. Read it not only to get a sense of what’s being written right now, but also to get a new sense of the capabilities of poetic language. Portuguese at Powell’s City of Books! Portuguese at Tin House Books! You can find some of Nathan Moore‘s work at Heavy Feather Review, Pudding Magazine, Everyday Genius, Menacing Hedge, and Fleeting Magazine. He posts paintings and other things here.